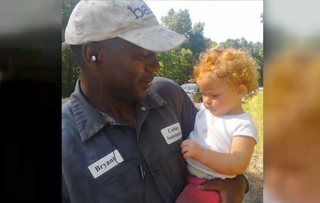 Bryant Collins holds the 15-month-old child he found on the side of Highway 72. The last thing one Georgia man expected to see during a routine drive down the highway was a 15-month-old baby crawling near the embankment. “What the hell is going on? A baby?” was Bryant Collins’ knee-jerk reaction to his unusual discovery, according to 11 Alive. Collins said he caught a glimpse of something out of the corner of his eye that prompted him to stop his car and get out to take a closer look, 11 Alive reports. Apparently the 15-month-old had managed to crawl 300 yards from her home, passing through the woods, onto Highway 72, which runs through Madison County, Ga.
Collins sprang into action by calling 911. He then remained by the baby’s side for two hours while emergency crews responded to the scene. To calm the baby’s distress, Collins said, “I turned my phone on and let her listen to some gospel music, and she calmed right down,” 11 Alive reports. The child was unharmed, according to Madison County Sheriff Kip Thomas. “Honestly, that's almost a miracle: that a 15-month-old can … wind up near a major highway and really not get hurt that bad,” Thomas said, according to 11 Alive. Police arrested the child’s father, Timothy Pickens, and the mother may also be subject to arrest.